Do you have a Halloween hangover? We do. Halloween is a super fun event for the parents and kids in our neighborhood — we start by gathering in a neighbor’s garage for a potluck dinner and then pile the kids in wagons, golf carts and on good, old-fashioned foot to trample the neighborhood for hours. At some point, the wine is uncorked and dads’ tend to disappear into friends’ houses for a quick bathroom break and a beer. It is truly one of my favorite nights, but it is exxxxxhausting! 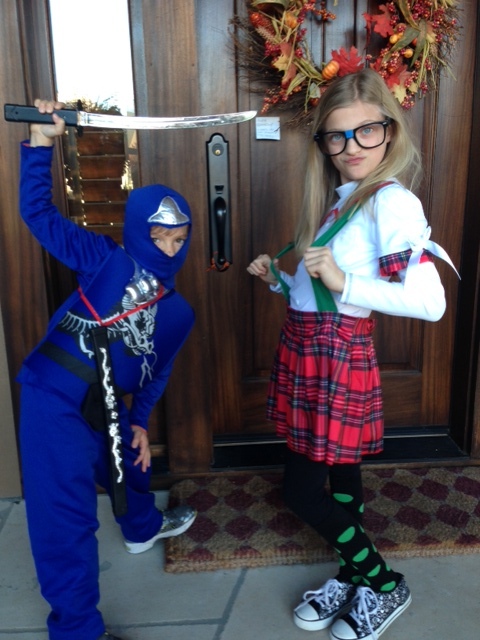 Here’s a quick look at my two oldest hoodlums. I like to call them NinjaNerd. I wish I could tell you that I got up this morning and made this awesome french toast for my tired kids (because that would be so totally June Cleaver), but I didn’t. I threw them on the couch with a Z-bar and a Danimal and called it good. 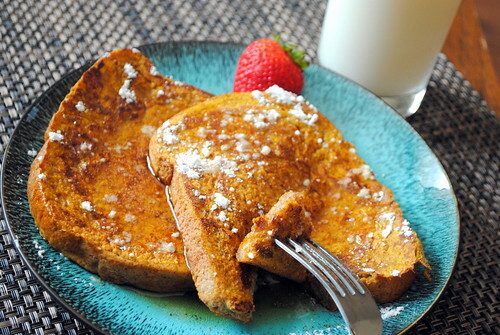 But I did make this last weekend and it was our favorite french toast ever. Something about the thick, crusty bread — drenched in pumpkin and lightly scented with spice — and drowned in butter and pure maple syrup; it made for a very happy Saturday. It only takes a second to whisk this up, but it tastes like a million bucks. Two words: make this. Heat a griddle or nonstick pan to medium heat. Whisk eggs, milk, pumpkin puree, vanilla, pumpkin pie spice and brown sugar in a pie plate (pie plates are easiest for dipping). Dip bread into the egg mixture on both sides and grill in a pan until lightly golden brown, about 2-3 minute per side. Drench Drizzle with maple syrup.